One thing I’ve noticed about some of Delhi’s best street food is the quiet pride shown by the men who make it. No showy displays, no sweet-talking the customers, there’s an almost arrogant ‘take it or leave it’ confidence; here, the food does all the talking. Mr Jain is no exception, he has the intensity of a Gordon Ramsay. He watches his two helpers like a hawk – everything has to be prepared just so – and takes no nonsense from customers. I was left in no doubt that photography of his stall would not be permitted – I was here to eat and not collect souvenirs! The pride, it turns out, is well-founded. There’s no shortage of bedmi wallahs in Delhi but Jain Sa’ab is in a class of his own. His lentil-laced crunchy puris are served with a deeply savoury, meltingly soft potato and chhole (chick pea) curry drizzled with a sharp fenugreek leaf chutney. But what marks him out from other bedmi shops is the side portion of tangy, sweet pumpkin which gives the whole dish a perfect balance. There’s also a final flourish of pickled carrot and I couldn’t decide which combination made for the most satisfying mouthful – I suspect a return trip may be needed to nail it! One thing is for sure, though, the wonderfully fresh and creamy sweet lassi was the perfect accompaniment. For a sweet final flourish we also could have had a pudding from the bubbling pot of Gulab Jamun. As Jain Sa’ab knows only too well, this is Indian street food at its finest! A measly 200 yards to right from T junction there’s a sardarji’s shop ( over 50 yrs old), arrogant that the senior sardarji was, his bedmi’s and carrot and radish pickle with awesome potatoes curried, all fresh,piping hot. His hot samosas and Jalebis are worth dying for. Trust me folks, I grew up there, studied in Cambridge School taught by a Scot lady Mrs Sutherland. Narender – I can see closer inspection of Daryaganj is required! No doubt Jain Saheb’s bedmi aloo with sitaphal(pumpkin) subzi is outstanding. But it in old delhi (bazar sitaram etc) many others also sell comparable stuff. It is incomprehensible as to why inspite of charging quite a bit and enormous sales leading to profits of at Rs.5,000/- a day, he insists on keeping broken tables and chairs. Also if served in steel plates, it would be more convenient and tasty also. Veekay, well I absolutely loved Jain Sa’ab’s bedmi! Can someone help me with the recipe for this yummy looking dish? Do you have the recipe for the gajar ka achaar?Just irresistable.Yum……. Where exactly in Shanti Niketan and on which days does the farmer’s market come up? My grandparents used to live in Daryaganj and I remember the amazing Sunday morning poori aloo breakfeast in that ancient ansari road gali number 3 home :). There is a sardarji’s shop on ansari road where we got our breakfeast from. I wonder if “narender” is referring to the same one. The aloo ki sabzi is fiery! with pieces of moongra (a kind of namkeen, if I spelt it right). He makes his poori only from 9-11am in the morning. geekymaira – thanks for lovely comment – I need a closer inspection of Daryaganj! Arunima, Sahiti – recipes coming soon…. You’re welcome Pamela. Love your blog! 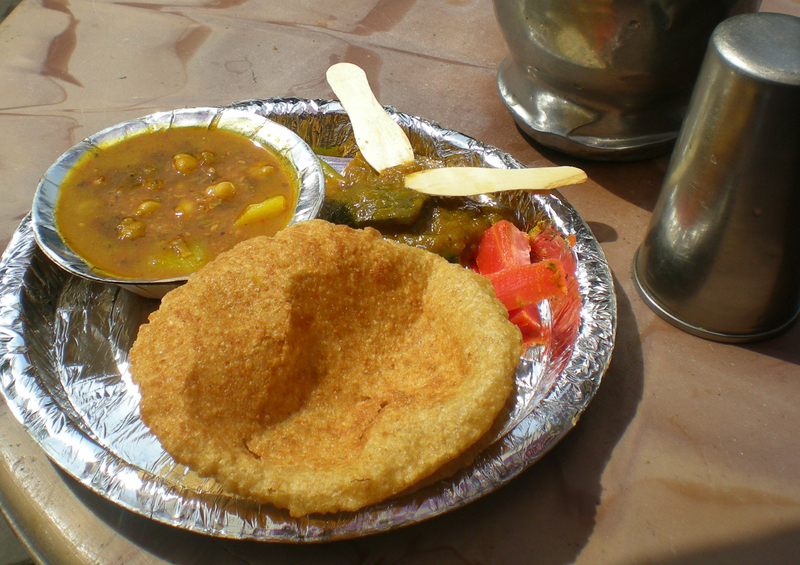 Pamela, on paranthewali galli, as you start walking, around the bend there’s a kachori wala– literally a hole in the wall! The “kachori and alu kane ke baadh” “daeyth hi ho jayega” as the Punjabi’s would say!! There’s also a Nan Katai chap right there selling warm Nan Katais from a cycle — again to die for! loton cholly wala more popular all in a.rd. delcs. red chilly cholly yam yam,n chkn chowmin at sbi chowmin bus stand here 30 years.